Its neck to neck with future teammate Robert Farr. The Rockets leading scorer was also the MAC Gold's leading scorer, Farr scored 435 points this year, the closet play was Tyler Smith with 398 points this year. Farr also had several game winning shots and a game winning slam dunk. Farr also led the Gold with 303 rebounds, 128 which were offensive rebounds. Besides Smith running the court on offense he is just as solid, if not better on the defensive end. Smith had 64 steals which led the MAC Gold. Smith totaled 98 rebounds, 72 were defensive rebounds. Smith and Farr will be playing at Concordia Universitytogether. The Senior guard averaged 10 points per game in 19 games and just 2 assists & rebounds per game. One of a handful of Sophomores who not only started but had a big role on the team. Moore finished with an average of 6 points per game but played at a really high level for the Rockets all year. Bell filed in for the suspended Farr for one game, if you did not see New Haven play that night, your opinion of them would not of changed. Coach France was able to keep the Rockets playing at a high level all season. With a team full of sophomores and 2 seniors, you would expect a lot of noticeable flaws. But that was not the case, when players were not doing well, they were taken out of the game and coached. They back and did really well. The MAC Gold was really tough this year but New Haven nearly won it. It is tough to tofocus on just 1 sophomore because they all played really well. The Saints were hot to season but faded, however towards the end they quickly came back and earned a share of the MAC Gold title. Mount Clemens just needed to win out after beating SterlingHeights on Valentine's Day but Saint Clair had different plans. The quick and aggressive Saints defeated top dog Anchor Bay at Anchor Bay during the districts but they fell to L'Anse Creuse in the district final. The Saints went 16-7. Both Saint Clair and Mount Clemens went 8-4 in the MAC Gold, splitting the title with one another. REESE -- Saginaw Nouvel Catholic Central had four big men to use against New Haven. The Panthers, however, did not have Robert Farr. Farr, New Haven's 6-foot-5 senior, scored 28 points and grabbed 21 rebounds to lead the Rockets to a 65-54 victory over Nouvel in a Class C boys basketball regional semifinal game at Reese High School on Monday night. "Robert is the best post around," New Haven guard Tyler Smith said after the Rockets lifted their record to 16-8 with their fourth tournament victory of the year. "He stepped up his game," Smith said. "We just kept feeding him the ball." Matched against the Panthers' wiry big men, including 6-7 junior Tony Purifoy, who scored 17 points, Farr had to find a balance between being aggressive and laying back. "I didn't want to get into foul trouble," Farr said. "I didn't want to put a body on them too much. But I had to go after them." "They were skinny. I knew I could move them out of the way. They were good, don't get me wrong. They were the best challenge we had all year. But we were stronger." Sophomore Jamael Bell scored 12 points, sophomore Rayshawn Griffin had nine and Smith, a senior, made 10 assists as New Haven became one of three Macomb County teams to win a regional semifinal game. Trevor Bonhoff, a 6-6 junior, had 10 points for Nouvel, while 6-6 Shaughn Handley had nine and 6-4 Jack Snyder added eight. "We played real well on defense tonight," Smith said. "That's what carried us to the victory. "We moved our feet and we clamped down on them on defense." New Haven, which lost to Nouvel in a 2007 regional game, sputtered early in the fourth quarter as the Panthers cut a 15-point deficit to six, closing to 52-46 on a basket by guard Joshua Buchalski with 5:13 to play. But Farr split a pair of foul shots for a 53-46 lead with 4:12 to go, and then Smith assisted on a hoop by Bell and Farr made two long, baseball-style passes, first to Bell and then to Griffin, for layups that gave the Macomb Area Conference Gold Division Rockets a 59-52 lead with 90 seconds to play. "I'm so proud of our guys," Tedaro France, the Rockets' coach, said. "We came out strong and we stayed strong. We played great defense. "Our league is a tough league. All the tough games we had got us ready for this. "We kind of challenged the guys, especially Robert, about (Nouvel's) big men. I think that got our guys fired up." 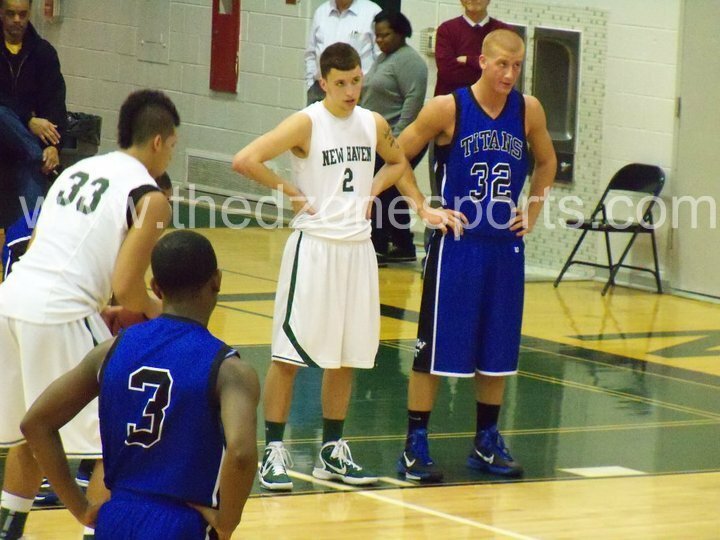 New Haven rode Farr's 14-point second quarter from a 17-13 deficit to a 34-27 halftime lead. Farr added five rebounds in the quarter. New Haven got ahead by nine in the third quarter, and then Nouvel rallied to within three. But two Farr free throws, two buckets by 10th-grader Roemello Moore and Smith's buzzer-beating triple from the corner pushed New Haven's lead to 52-37 at the end of the third. New Haven plays for the second regional championship in school history when the Rockets take on Saginaw Buena Vista at 7 p.m. Wednesday in the title game at Reese. Senior guard George Goodman scored 27 points to lead Buena Vista (18-5) to a 94-51 victory over Harbor Beach in the first semifinal game. New Haven won the Brown City district tournament, while Buena Vista won the New Lothrop district. The Rockets won their only regional championship in 1990. Nouvel (12-11): Jack Snyder 8, Shaughn Handley 9, Joshua Buchalski 7, Trevor Bohnhoff 10, Ty Jacobs 3, Tony Purifoy 17. Totals: 25 (2) 2-12 -- 54. New Haven (15-8): Tyler Smith 2, Rayshawn Griffin 9, Jamael Bell 12, Roemello Moore 5, Robert Farr 28, Paul Evans 4. Totals: 26 (1) 12-18 -- 65. BROWN CITY -- At the beginning of the season, they yelled at one another. On Friday, they yelled together as district basketball champions. Seniors Robert Farr and Tyler Smith scored 19 and 17 points, respectively, to lead an otherwise young New Haven team to a 66-45 victory over Vassar in the Class C boys district final at Brown City High School. Trailing 19-15 after one quarter, New Haven switched to a zone defense and outscored the Vulcans 34-15 in the second and third quarters combined to win going away in a setting that had a retro feel. New Haven, a member of the Macomb Area Conference Gold Division that did not play a Class C school until the state tournament began, started three sophomores with Farr and Smith as the Rockets captured their third district crown since 2006, and their first under former New Haven player Tedaro France, now their coach. “It was hard at the beginning of the season,” Farr said. “We were yelling at each other all the time. But we came together at the middle of the year. Farr, Smith and France agreed that a mid-season MAC crossover victory over Class A L’Anse Creuse North, the defending Red Division champion, proved to the Rockets they could mesh their veteran and young talent. “Everybody realizes what we have to do,” said Smith. “It’s tournament time. The sophomores aren’t sophomores anymore; they’re juniors. The Rockets’ eighth district championship since 1990 was achieved at a Brown City gymnasium where New Haven and the Green Devils had numerous battles when both were members of the Southern Thumb Association. The Brown City gym is a throwback, with a relatively low ceiling and wooden bleachers that sit close to the court. And on this night, in a match-up of small-town teams, the Rockets’ three-sophomore starting lineup could have reminded long-time New Haven fans of the 1968-69 team that featured 10th-graders Eli Sims, Roy Lee and Scott Belt in its starting unit. That club, too, was a district champion. “It feels great to win,” France, a basketball and football standout at New Haven, said after his team won before a crowd that included former Rockets standouts Chris Dilbert and Don Sims. “This is my home town. “Even though I played football (at Central Michigan), I love hoops. I love doing this. Vassar, a member of the Greater Thumb Conference West, which includes Reese and Bad Axe, was led into the final by 5-10 sophomore guard Nathan Greaves, the Vulcans’ leading scorer. The redhead scored 11 points in the first quarter, helping the Vulcans take a 19-15 lead, and it looked like Vassar, a Class B school last season, might be on its way to its first district title since 2003. However, New Haven switched from a man-to-man defense to a zone starting in the second quarter, and Greaves would score only six points the rest of the way. “They went to a zone and we never recovered,” said Vassar coach Chuck Fabbro, who, like France, coaches at his alma mater. France thought a Brown City zone in a district semifinal game bothered the Vulcans, who finished with a 12-10 record. With Greaves unable to get the same looks at the basket he enjoyed in the first quarter, and Vassar turning the ball over on occasion, Smith scored nine points and sophomore Roemello Moore added five as New Haven went on a 17-7 run in the second quarter. On their first possession of the second half, the Rockets fed the ball inside to the 6-5 Farr, whose spin move to the bucket resulted in a field goal that increased New Haven’s lead to 34-26. Then the Rockets turned their offense over to their ballhandlers, including Smith, Moore, Rayshawn Griffin, Jamael Bell, Vantrell Williams and Tedaro France III, who spread the Vulcans defense and created more scoring chances for Farr and others. The Rockets finished with six 3-point field goals, including two each by Griffin and the left-handed Smith. Griffin scored 11 points for New Haven, which led by 18 points midway through the fourth quarter and closed the game on a 7-0 run. Bell added 10. Greaves finished with 17 points for Vassar. Madison Harper, the Vulcans’ captain, added nine. New Haven plays Saginaw Nouvel Catholic in a regional semifinal game at Reese on Monday. Nouvel defeated Beaverton 52-40 in the district final at Merrill. New Haven (16-7): Tyler Smith 16, Rayshawn Griffin 11, Tedaro France III 3, Jamael Bell 10, Roemello Moore 7, Robert Farr 19. Totals: 26 (6) 8-13 -- 66. Vassar (12-10): Nathan Greaves 17, Brandon Peter 6, Kyle Avernhamer 3, Gavin Greer 2, Madison Harper 9, Josh Peplinski 8. Totals: 18 (2) 7-13 -- 45.